We just left magical Flores, Guatemala and are now in our lovely Airbnb in the historic center of Guatemala City. Our first impressions of our neighborhood were fantastic. It is lively, interesting and there is plenty to keep us busy. We went out to lunch and to the market so we could head home and nap. Our alarm was set for 5 a.m. that morning. After napping, we planned a lazy evening and thank goodness. That is when the worst bout of food poisoning hit us. Kim got it first. I came down with it about four hours later. And before you ask, we did not eat any street food. Luckily our bathroom was newly remodeled and spacious because we spent the whole night in there. Four days later and we are still not 100 percent, but the adventure continues. We spent the week nomading about Fores, Guatemala and Tikal National Park. If Tikal is any indication of what the Mayan civilization was like, then it was one of the greatest civilizations to have existed. It’s one thing to see pictures of these immense temples, it’s another to be dwarfed while standing in front of a 64 meter (212 foot) tall temple. Getting to Flores was not wonderful. We decided to take a bus (this must have been a drunken decision). But, Flores was beyond our expectations, we might move there. No, seriously. The lake is clean and clear, the people are friendly, the food is good, the pace is relaxed, and there is a focus on keeping the environment clean. Walking into Tikal is like walking into a fairytale. The buildings are out of proportion from our perspective and the architecture is so foreign it could be from another world. In fact, George Lucas used Tikal for the scene of another world, Yavin 4, in Star Wars – Episode IV. The day was perfect. It was warm, but there was a steady breeze and plenty of shade. Kim was worried since her last outing to a Mayan ruin ended in heatstroke. Nothing to worry about. We hydrated and hung out in the shade as much as possible. We even brought umbrellas for shade, just in case. We spent 4 hours at the park and it was not nearly long enough to see everything (even for Kim!). I was in Tikal in 1992 and it was not as developed. Today visitors can access the temples via well constructed wooden stairs. In 1992 we were climbing on questionable handmade ladders and clinging onto roots and rocks. It was better then. If Tikal is not already on your travel list, put it on the list and put it on top of the list. We spent most of our time in Flores, which is the capital of the department (state) of Peten. I was also here in 1992 and the lake smelled of sewage and the island was dirty. Today you can swim in the lake, and many people do, and the island is spotless. When we arrived 100+ university students were doing an annual clean up of the island and lake and daily we ran into the ‘island custodian’ (my term), who walked the island with a broom and bucket. University students cleaning up the lake. Flores is like a little mini Italy. It’s built in a Colonial Architecture style and has cobbled streets, and narrow walkways [picture]. It is a tourist town, the gateway to Tikal, but it does not have the tourist vibe. Flores has found that elusive place between being local and having all the things tourist want; modern accommodations, excellent restaurants, fun bars. In fact, we enjoyed several coffees from our office for the week, the rooftop bar. The apartment we were renting did not have a proper workspace, so the owner opened the bar so we could work. Needless to say, Kim and I didn’t mind working quite so much this week. We reluctantly ended the week flying to Guatemala City and you already know what happened on the first few days here. Additionally, We plan on taking our “What $100 will buy you?” series to the next level. Guatemala is super inexpensive. So we are going to see if we can live on $100 for the week – not including our Airbnb. And that’s about it for now. We’ll see you next week. We posted two videos this week, Recommended Las Vegas Food Joints where we eat at friend recommended places in Las Vegas. We were able to get to The Donut Bar, The Bagle Cafe, Ethel M. Chocolates, and The Nine Fine Irishmen. This was one of our favorite videos to do because we love to eat and the food was fantastic. 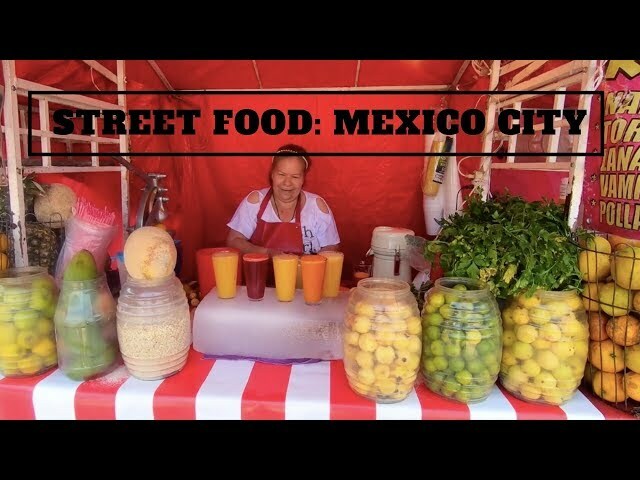 We also posted the first video in our Mexico City series. It’s a tour of The Zocalo in Mexico City with a tour of Diego Rivera’s murals at the National Palace, a walk through the National Cathedral, views of the 700-year-old Mercado De Artesanias, and the flag lowering ceremony.